Just when you thought that you’d gotten rid of me for good……..I’m baaa-aaaack!! My intended-to-be-brief blogging break, while I wowed the food folks at the Fancy Food Show with my granola, turned into a summer long blog-cation. There were several occasions when I came really close to whipping up something sweet in the kitchen, but let me tell ya, oppressive 113F degree temperatures pose a strong argument as to why baking is a bad idea. Soooooo, I feel that I must apologize to my loyal readers…..and to the bison. No, Peanut Butter and Julie doesn’t have a huge bison following (at least not according to my Google Analytics data). The reason why I’m offering up a buffalo apology can be found below, in my TEN THINGS THAT KEPT JULIE BUSY DURING HER SUMMER VACATION list (and a few photos too)!!! It’s not that my summer was all that fascinating or life-changing (so feel free to skip down to the recipe if you’re short on time, or patience. This is going to be long, and quite possibly boring.) I just feel like I should account for my whereabouts over the last 2 1/2 months so that you don’t think that I spent my entire summer watching Real Housewives marathons on Bravo. Please. I only did that for the month of July. 1. When last we met, I was headed off to the summer Fancy Food Show in the Big Apple, where I planned to peddle my granola to some 25,000 attendees. Piece of cake, right? It’s a miracle that my booth was ready in time, seeing as I was the one responsible for building all of the display cases, but in the end everything came together nicely, and I was very happy with the results (see photo to the right). If nothing else, I’m sure that the guys from Local #457, who were setting up the booth next door, were impressed enough with my carpentry skills to hire me if this granola thing doesn’t pan out. The show was exhausting — talking and smiling and talking and selling and smiling and talking for seven hours straight, three days in a row. I’m pretty happy with our results though. As of today, we are in about 30 stores nationwide……and still growing. Be sure to check out my new site too! 2. For someone who spent the entire day in a large convention center filled with every kind of food sample imaginable, I sure did walk away famished each evening. I’m not very good at eating when I am focused on my work. I’m not very good at drinking water either, but passing out from dehydration isn’t the best way to sell a product, so I forced myself to down a few bottles. Anyhow, the upside of this day-long fast was that I felt like I had earned a really good dinner each evening. After the first day of the show, we has reservations at Otto, one of Mario Batali’s more casual restaurants. I have sort of a culinary crush on Mario. This is the fourth time that I have visited one of his restaurants, and I have never ever had a single dish that was anything but outstanding. Eric, myself, and our two good friends (who happened to also be named Julie and Erik), worked our way through what seemed like half a menu’s worth of Italian cheeses, charcuterie, pizza, and pasta, until every last bit of olive oil was mopped up with soft, fresh ciabatta and there was nobody else left in the restaurant. Trust me. Mark this one down for your next trip to New York. You’ll thank me later. 3. At the beginning of August, we took another trip. This time it was an actual vacation, to Jackson, Wyoming, one of my favorite places in the world. If you find it odd that one of my favorite places in the world is located in Wyoming, well, then you haven’t been to Jackson. Either that, or you find the idea of fresh mountain air, beautiful scenery, top-notch outdoor activities, wonderful people, and great food unappealing. 4. Eric and I love to hike. I’m all about the fantastic workout that hiking provides in the great outdoors, while Eric likes the exercise in conjunction with the scenery, wildlife, photo opps., blah, blah, blah. I like to think of myself as a competitive hiker. Eric calls me an aggressive hiker. Whatever. Just because I like to pass as many people as I can on the trails, and then after I pass them there is no way that I will let them catch up with me, even if that means that I won’t stop no matter how out of breath I am…….does that make me aggressive??? O.K., maybe a little. On our way down from a very strenuous uphill hike, we came upon something that made even me stop and stare. About 10 feet away stood a huge moose with gorgeous antlers, just snacking on some leaves in the woods. I couldn’t believe how close he was to the trail (photo below), and he barely seemed to notice the group of ten that had assembled to take pictures. That is, until he did. He looked up, and he took the tiniest step forward. Translation: You folks best be on your way. He didn’t need to tell us twice! 5. Ah yes, the bison. The apology. I ate a LOT of buffalo dishes while in Jackson. It’s kinda hard to not eat a lot of buffalo there, because it’s on every menu in every way, shape, and form. Buffalo medallions, buffalo carpaccio, buffalo soft tacos, buffalo jerky, buffalo burgers, buffalo rib-eye, Thai buffalo salad……you name it, they make it. If I was worried about any iron deficiencies before the trip, I’m good now. 6. This summer, I gave directions to Flava Flav. Mom, Google him. He’s a rapper/reality show star. Apparently, he lives here in Las Vegas. I was outside of the kitchen where I make my granola, accepting a delivery from the UPS guy, when who should pull up in a white SUV?? I recognized the very distinct voice first, but then I saw the signature clock around his neck. I guess that he wears these for casual errand-running too, huh? I imagine that he has an entire closet at home dedicated to just clocks. Anyhow, I think that I messed up the directions. Flav, if you’re reading this, sorry. 7. In other celebrity sighting news, I saw 3/4 of the band Motley Crue (Vince Neil, Tommy Lee, Nikki Sixx), while waiting for my connection home to Vegas at the Salt Lake City airport. Vince was on my flight home. Apparently, he lives in Las Vegas too. I wonder if he knows Flav? Tommy Lee was trying to be incognito in the waiting area, but he sort of stood out among the Salt Lake crowd. Perhaps we can look forward to a reunion in the near future??? 8. I saw Inception. That was the only movie that I actually made it to this summer, although I wanted to see several. O.K., so I’d love to say that I completely got what they were going for with this flick……but HUH? Maybe I need to see it again, knowing what I know now. Plus, at risk of sounding like a curmudgeon, since when do we need to see ten commercials before the ten trailers before the movie? I could have been an hour late and still caught the opening credits! 10. Finally, this summer, I was happily astounded to find something that I have never ever been able to find in Las Vegas before: good fresh peaches. Year after year I have purchased a few to try, and year after year the peaches that were advertised as “Fresh! Juicy! Sweet!” have been “Tough! Mealy! Bland!” Maybe is was the cute, rustic crate that they came in, or maybe it was the store’s unblemished reputation, but something told me to give the peaches that I found at Trader Joe’s a try. Thank goodness that I did. These were bona fide top-notch juice-dribbles-down-your-chin summer peaches, and I have been buying about a crate a week ever since. When making the custard for the ice cream, if the eggs start to “scramble” a bit, you have likely left the mixture over heat for too long or the temperature was too high. Never fear! You can fix the texture of the custard by running it through a mesh strainer into another bowl, which will remove all of the lumps. If you like some spice in your ice cream, feel free to add some cinnamon, cardamom, ginger, allspice, nutmeg, or a combination to the brown sugar before sprinkling it over the peaches. For a more subtle approach, add a cinnamon stick to the milk before heating it, and then leave it in until just before adding the custard to your ice cream machine. Depending on how juicy your peaches and blueberries are, your buckle may take a bit longer to bake. If the topping becomes too dark, then loosely cover it with foil until the buckle is bakes through. The buckle should keep, tightly covered at room temperature, for 3-4 days. Preheat the oven to 375F degrees. Line a baking sheet with parchment paper, and place the peaches, cut sides down, on the sheet. In a small bowl, toss the brown sugar with the salt; sprinkle over the peaches. Roast the peaches for 25-30 minutes, mixing occasionally, until the peaches are soft and caramelized. Peel the peaches when they are cool enough to handle; coarsely chop. In a medium bowl, beat the sugar with the eggs until the mixture is thick and pale yellow. Beat in the flour; set aside. Bring the milk to a simmer in a medium saucepan. Slowly beat the hot milk into the egg mixture, whisking constantly as you pour. Pour the mixture back into the saucepan and place over low heat. Stir constantly with a whisk or a wooden spoon until the custard thickens enough to coat the back of a spoon. Be careful to not let the mixture boil. Remove from the heat and pour the mixture into a large bowl. Allow the mixture to cool slightly, and them stir in the vanilla, chopped peaches (including any accumulated juices), and the cream. Cover and refrigerate until cold or overnight. Freeze the custard in your ice cream maker according to the manufacturer’s instructions. 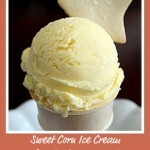 When finished, the ice cream may still be a bit soft, so transfer to an air-tight container and freeze for 2 hours. Preheat the oven to 350F degrees. Spray a 10-inch springform pan with nonstick baking spray. In a medium bowl, whisk together the flour, baking powder, salt, cinnamon, and cardamom. In the bowl of an electric mixer fitted with the paddle attachment, beat the butter with the sugar until light and fluffy, 3 minutes. Add the lemon zest, eggs, and vanilla; beat until well combined. Add the dry ingredients in 2 batches, alternating with the half and half, and beat until the batter is smooth. Gently fold the blueberries into the batter. Spoon half of the batter into the prepared springform pan, and then layer the peaches on top of the batter. Spoon the remainder of the batter over the peaches, smoothing with an offset spatula. Prepare the streusel: In a food processor, pulse the flour with the brown sugar, cinnamon, and salt. Add the butter and process until moist clumps form. Add the pecans and pulse a few times. 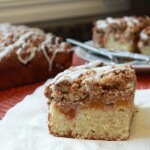 Evenly sprinkle the streusel topping over the batter, pressing lightly to adhere. Bake the buckle for 60-70 minutes or until the topping is golden and a toothpick inserted emerges clean. Allow the buckle to cool for one hour before removing it from the pan. Welcome Back! The summer sounded busy, but the recipes, buckle and ice cream, sound delightful. I will be making them this weekend. Thanks so much, Jean! I hope that you enjoy them as much as we did. Im afraid that my peach buying days are numbered, now that the summer is almost over! Glad you’re back! I enjoy hearing about your summer. I was at DiBruno Bros this week and was able to get some of your yummy granola. I’ll have to try this recipe with some Jersey peaches. Yay, glad you’re back and had a fabulous summer! And what a dessert to return with – I’m drooling! Hi Janet! Thanks so much for your kind comment. I know that those New Jersey peaches will make the buckle even better!! Enjoy!! Hi Lisa! Thanks–I was afraid that Id forgotten how to blog!! Thanks for going to DiBruno. Im so jealous…….I might need to make a trip back east to visit my granola (and my friends!!) Have a great weekend! Thanks, Kerstin! Great to hear from you. I hope that you had a fabulous summer as well!! Thank you, Kathy! I know — I almost thought that I was seeing things when I saw the clock around his neck. Im not certain that its entirely necessary on a random Tuesday afternoon….. Its nice to be back in the blogging world! Love Love Love How the booth turned out!! YEAH! You’re back! I was looking for something new and inspired to bake…. Can’t wait to try the buckle! Thanks, Christie!! It received a lot of great comments. Everyone loved the photo! Thanks, Susan! Im glad that I inspired you — enjoy the buckle! I have enjoyed looking at so many other sites and how people pour out their passion with others… I started “slowly” but surely when I have the time keeping a blog as well.. blessedhousewife.com and have soooo much enjoyed all you post, and meeting people with similar interest!!!! 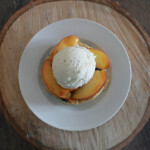 Oh my.. That’s a mouthwatering Caramelized Peach Ice Cream. yum yum! If you wont mind I’d love to guide Foodista readers to your post. Just add the foodista widget to the end of this post so it will appear in the Foodista pages and it’s all set, Thanks! Yay – you’re back!! Sounds like you were a smash success – 30 stores (and counting!) – WOW!!! Not surprising…your granola is fabulous!! What a beautiful slice of cake. I love how it’s so studded with fruit. The ice cream also looks so good, and, as for the pic with the two together, well, words fail me.